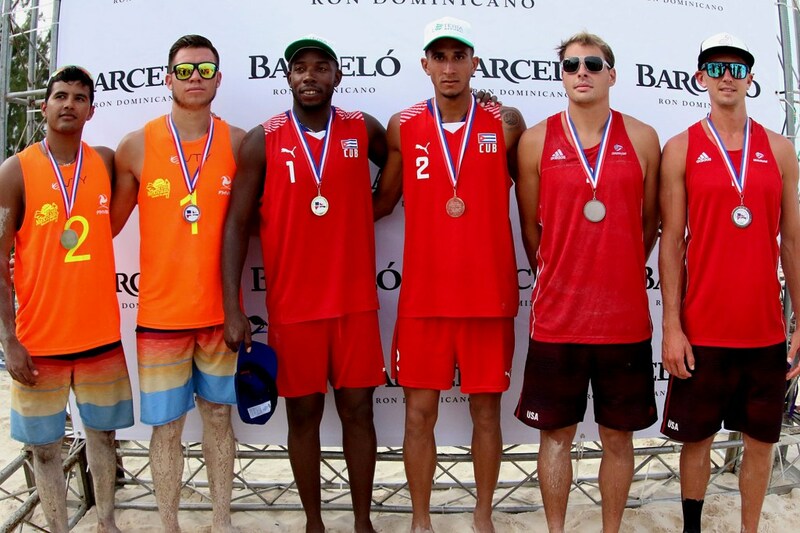 PUNTA CANA, Dominican Republic, September 30, 2018 – Cuban Karel Peña won the men’s segment of the Punta Cana Beach Volleyball Tournament for the third time in the four-year history of the competition. Peña who won in 2015 and 2016 associated with Daisel Quesada took the title this time combined with young Luis Enrique Reyes as they edged Mexicans Josué Gaxiola and José Luis Rubio 2-0 (21-15, 22-20). In the match for the bronze medal, Eric Zaun and Avery Drost of United States cruised past Canadians Sergey Grabovskyy and Fiodar Khazamiaka 2-0 (21-13, 21-17). In semifinals, Gaxiola/Rubio overwhelmed Grabovskyy/Kazhamaiaka 2-0 (21-10, 21-13) and Peña/Reyes defeated Zaun/Prost 2-0 (21-15, 21-17). Grabovskyy/Kazhamaiaka beat Denis Sebastian and Sneider Rivas of Colombia 2-0 (21-10, 21-17), Gaxiola/Rubio dominated Richard Smith and Bryan Monge of Costa Rica 2-0 (21-12, 21-13), Peña/Reyes defeated Rubén Mora and Dany López of Nicaragua 2-0 (21-18, 21-12) and Zaun/Drost vanquished Cristian Encarnación and Josué Rivera of Puerto Rico 2-0 (21-16, 21-17).